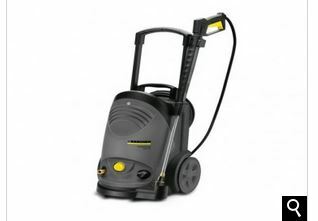 Karcher are industry leading suppliers of pressure washers for commercial, industrial and domestic purposes. At Britclean we stock an extensive range of Karcher pressure washers with both hot and cold water versions available. Karcher offers versatile, easy-to-use cleaning solutions for a huge range of industries and quality is guaranteed. They pride themselves on providing customers with all the cleaning power, toughness and low running costs they demand. Karcher pressure washers excel in outdoor cleaning options. Whether you want to hose down your car, bike, van or lorry Karcher will get the job done quickly and effectively. Up to 35x more powerful than a regular garden hose, these pressure washers make short work of any hard to remove dirt. Amazingly, they also use up to 50% less water than a garden hose! The range of problems a Karcher pressure washer is able to tackle around the home can really help you bring the best out of your property. They can make cleaning your roof and gutters out a breeze as well as cleaning your outdoor decking, fencing, patio, paving or driveways. Additionally, Karcher pressure washers strive to be the most eco-friendly and fuel efficient products on the market. You’ll be amazed at the long term savings you can make. Offering exceptional value, reliability and performance a Karcher pressure washer can help find the ideal cleaning solution for you. We have legions of satisfied customers and decades of experience in a vast range of industries. If you would like to know more then please don’t hesitate to contact us and one of our friendly team will be more than happy to help. We supply Karcher pressure washers to Stoke, Shropshire, Staffordshire, Cheshire, Derbyshire and beyond. This entry was posted in Britclean UK and tagged Karcher Industrial Pressure Washers, Karcher Pressure Washers, Karcher Pressure Washers Cheshire on February 16, 2015 by Julian Chadwick.